The Cuisinart ASR-1713V non-stick roaster is a perfect solution for everyday family meals, parties and holiday celebrations. 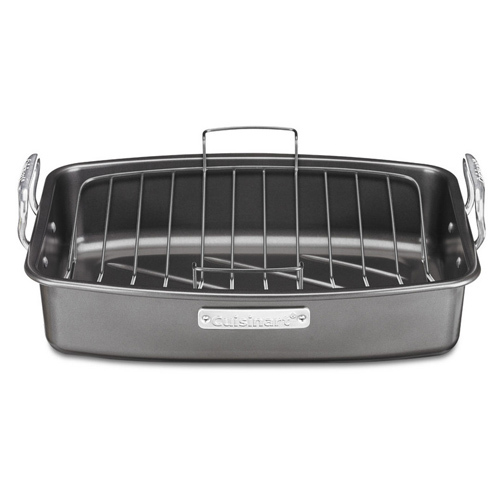 The roaster features heavy steel construction for fast even heating and optimal performance. The removable v-rack allows heat to circulate and let meat or poultry drain as it cooks. It has riveted wide-grip handle which allows it placing into the oven and lifting from oven easy and safe. The 17 X 13 Ns Roaster W/V-Rack Aluminized Steel Non-Stick Roasters has many exciting features for users of all types. See the 17 X 13 Ns Roaster W/V-Rack Aluminized Steel Non-Stick Roasters gallery images above for more product views. The 17 X 13 Ns Roaster W/V-Rack Aluminized Steel Non-Stick Roasters is sold as a Brand New Unopened Item.